Some people are naturally drawn to what they don’t have, always curious about what they might be missing out on. They often seen to be someone who searching for greener pastures, but sometimes it is a simple curiosity for what might be out there. 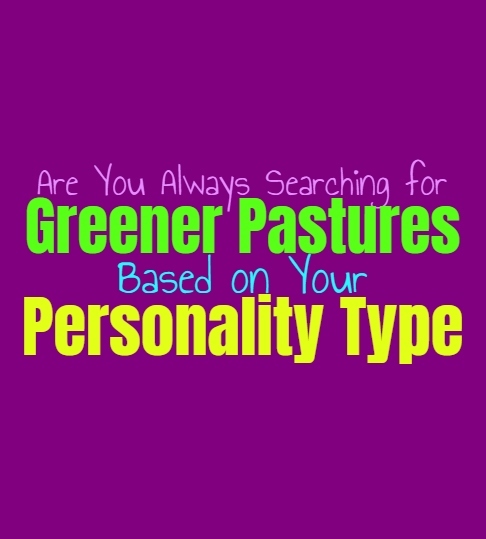 Here is how likely you are to search for greener pastures, based on your personality type. INFJs are often curious about what others might have, or what choices might have resulted in something different. At the same time they aren’t the type of people to actively search out greener pastures or better options, since they do believe in standing by their choices and commitments. INFJs might go through times when they dream of greener pastures, or of living a life much different than their own, but that doesn’t mean they will actually go after these things. For them it is important to dream about something better, but at the same time they don’t believe in lacking appreciation for what they have. ENFJs are very focused on the future and of building a life they can be proud of, and so part of them does often look for greener pastures. They are always hoping to move forward and to grow, and so this perfectionist nature does sometimes cause the ENFJ to continue searching for something better. When it comes to their job or their connections, the ENFJ wants things to be perfect and they often have high expectations. This can certainly cause them to hope for greener pastures, and to work towards gaining everything they want and more. INFPs are curious people who enjoy exploring different things, but this doesn’t mean they are incapable of appreciating what they have. When it comes to their careers and dreaming about something better, they do sometimes have this desire to search for greener pastures. But when it comes to relationships INFPs are very capable of committing to someone when they feel a bond which is deep and meaningful. For them the desire for greener pastures is more likely connected to other areas of their lives, especially if they have found someone they truly care for. When ENFPs are younger they do often find themselves drawn to greener pastures. They are curious people who can feel disappointed when they have missed out on something. This is why making decisions can be hard for them, since they don’t want to be stuck committing to something. ENFPs want to feel free to bounce around and experience something new, and so this does cause them to hunt for greener pastures. They are always feeling like they might have missed out on something, although this is something they often work through as they get older. INTJs believe in growth and always want to build themselves and their lives in a positive direction. While they don’t believe in just standing still and remaining stagnant, this doesn’t mean INTJs live in this belief that there are always greener pastures out there. They set goals from the start, ones which they want to work towards and accomplish. For the INTJ these are choices they really think through and analyze before making the commitment. They know what they want with most things in life, which helps them avoid this idea that something else better could be out there. ENTJs are very hardworking and committed people, who believe in working towards achieving their goals. They don’t often flounder when making decisions and can commit to things without having doubts in themselves. ENTJs aren’t really the type of people who are always looking at greener pastures, since they are often very sure of what they want. They spend time analyzing and thinking about their options, until they decide which one is the absolute best for them. This helps the ENTJ feel confident in their choices and because of this they don’t often feel like they could have chosen better. INTPs are curious people who don’t like feeling boxed into their choices, and so they do sometimes find themselves wondering if the grass is greener somewhere else. They can have doubts in the choices they make and don’t like feeling locked into something. INTPs sometimes have a fear of missing out, which makes it difficult for them to remain firm with things. They are always wondering how things might be elsewhere, their minds considering the different angles over and over again. ENTPs do sometimes feel like the grass might be greener somewhere else, since they often have a fear of missing out. They are curious people who want to experience new things in life, and don’t like feeling locked down to one choice. ENTPs sometimes want to bounce around and explore different option, so that they can learn from these experiences. Committing to one thing can sometimes be a challenge for their wandering minds, and so they do often feel like they need to hunt for greener pastures. ISTJs believe in standing by their choices and so they don’t often find themselves searching for greener pastures. ISTJs are often very sure and confident in their choices, making it easier for them to commit to things. They really think it through before they jump into something, wanting to know that this is truly the right choice for them. For the ISTJ it is best to be sure of things so that they can be sincerely confident in their decisions and happy with what they have. ESTJs don’t often find themselves hunting for greener pastures, since they are often more sure about what they want in life. ESTJs spend time really thinking about their goals and what they want to achieve, which makes it easier for them to be confident in these choices. For them always looking for something better is a sign of weakness and an inability to make the most of what they do have. The ESTJ is more likely to grow in their position and find ways to constantly improve the things they already have. ISFJs really don’t believe in searching for greener pastures, since they want to be happy with what they have. They believe in standing by their commitments and want to be sure of the things they have. ISFJs appreciate their loved ones and for them having people who care for them is the most important thing. They often have goals which they are sure of, and this helps them feel more comfortable standing by their choices without always hoping for something better. ESFJs are often sure of the things they want in life, and the goals they hope to achieve. They don’t need to constantly be hoping for something better, instead they hope to improve the things they already have. ESFJs do have high standards sometimes, but for them it is more about building something instead of always wanting to swap it out for something “better”. The ESFJ doesn’t often find themselves hoping for greener pastures, and even if they do they prefer to stand by their commitments and not back out. ISTPs do sometimes find themselves curious about things which are new and unknown. Their natural curiosity and desire to experience new things, does cause them to search for greener pastures. ISTPs simply don’t like feeling trapped or stagnant and enjoy being able to dive into something unknown. They want excitement in their lives and so sometimes the same things can become a bit boring. For the ISTP it isn’t always easy to commit to something unless it is continuously challenging and exciting them. ESTPs are adventurous and curious people who enjoy being able to dive into new adventures. They are excited by newness and want to be able to experience things without feeling restrained. This can cause them to be drawn to something different, and so they find themselves hoping for greener pastures. This can make it hard for the ESTP to commit when they are younger, always curious about what else might be out there. ISFPs are curious people who enjoy being able to experience new things and enjoy living in the present moment. For them sometimes there is this desire to really dive into something new, and so they do sometimes find themselves wondering if there is something better out there. They don’t find it easy to remain in the same position or to really commit to most things, since they want to feel free to change their minds. ESFPs can sometimes struggle to commit to one thing and don’t like feeling held back. They are curious people who enjoy diving into new experiences and often find themselves wondering what else might be out there. They do sometimes wander from place to place, wanting to uncover something which excites and inspires them. This does sometimes cause the ESFP to hunt for greener pastures, especially if things in their life aren’t really inspiring them the way they want.